Ajay Devgn‘s film Total Dhamaal which released on February 22 is doing wonders at the Box Office. 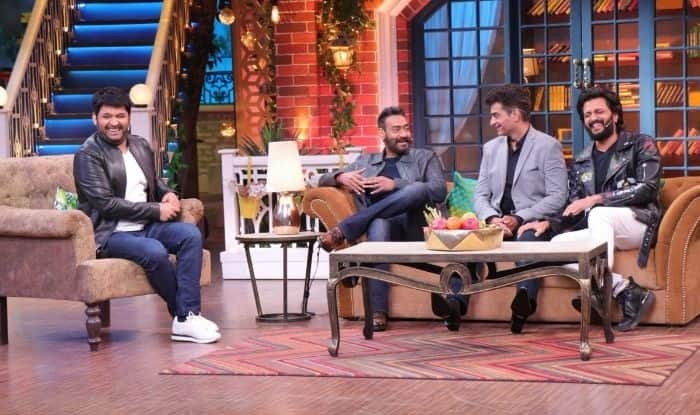 Recently, comedian Kapil Sharma congratulated Ajay on his film’s success and said that he will watch the film soon since he has heard good reviews about the film. Ajay had a hilarious reply to this and told Kapil to go and watch the film and laugh. Kapil took to his Twitter to congratulated the team of Total Dhamaal and wrote, “Congratulations @ajaydevgn paji @AnilKapoor sir @MadhuriDixit mam @Riteishd n the entire team of #TotalDhamaal hearing great reviews about the movie.. will watch it soon.” Ajay’s reply was just too hilarious. He wrote, “Tu picture dekh and for a change dusron ke jokes pe bhi has le.. sirf apne jokes pe hasta rehta hai hamesha! (Go and watch the film and for a change also go and laugh at someone else’s jokes. You only keep laughing at your own jokes). The film, which also features Anil Kapoor, Madhuri Dixit, Jaaved Jaferi, Riteish Deshmukh, Johny Lever, and Arshad Warsi, was released on February February 22. Indra Kumar had earlier revealed on a TV show that the film is a jungle drama and that the actors are sharing screen space with real animals. Earlier, talking about choosing to do comedies and how he trusts Indra Kumar with Total Dhamaal, Ajay told Mumbai Mirror, “It’s not about the franchise, it’s always about the script. Total Dhamaal makes you laugh and I want to be associated with clean comedies that appeal to families. As an actor, one looks out for things that have not been done before, Yes, there have been instances when I thought a film would work and it didn’t or even when I realised we weren’t achieving what we had set out to. The failure is always at the script level”. Ajay’s film is doing wonders at the Box Office and has minted a total of Rs 62.40 crore so far.